Delectable, wafer-thin crepes, the French variety of the traditional pancake, are as fancy and sophisticated as the French. In the hands of a capable cook; they can make anyone’s taste buds sing. 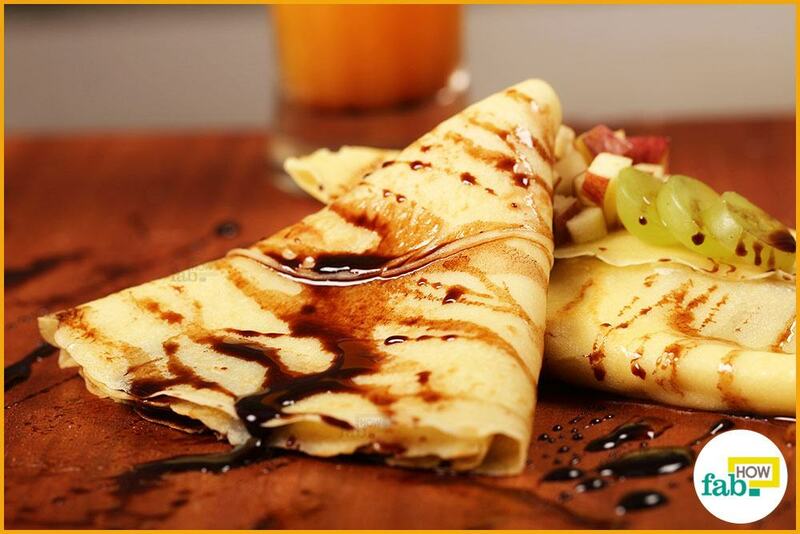 Sweet or savory, crepes can be made in a variety of ways. Fresh fruit, cream, honey, maple syrup, jam and even ice cream can be used as sweet fillings. Steak, sausage, smoked salmon as well as a variety of cheeses along with mushrooms and eggs make wonderful savory fillings. You may also use different vegetables and greens. Crepes are a thing of genius if you know how to work them. They make an ideal party snack that you can prepare ahead of time, adding the fillings at the required time. Being versatile, they’re a cook’s best friend when it comes to entertaining guests – a creative brunch, sophisticated lunch, lip-smacking dinner side dish or as a dessert on any occasion. Traditionally made from wheat or buckwheat flour, crepes have a strong cultural connection in France where they were made during the festival of La Chandeleur, which was related to prosperity in the coming year. 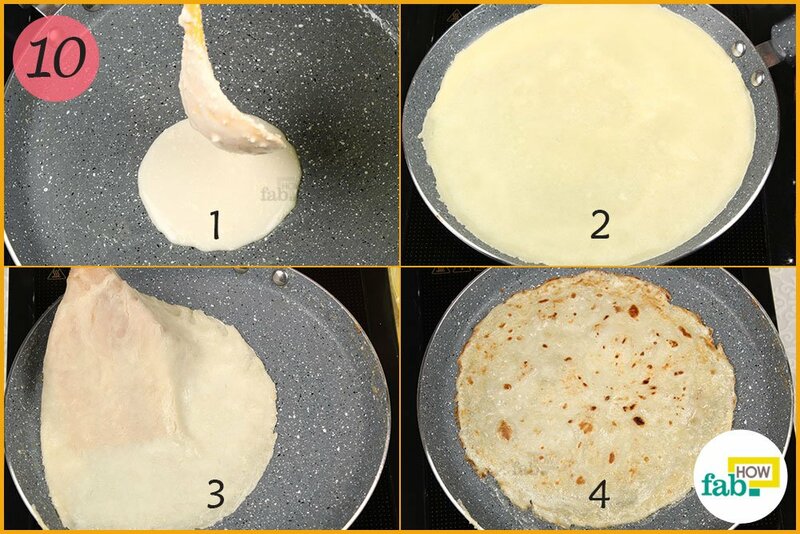 While the fancy crepe may appear difficult to make, going through the recipe step by step should simplify it for you. 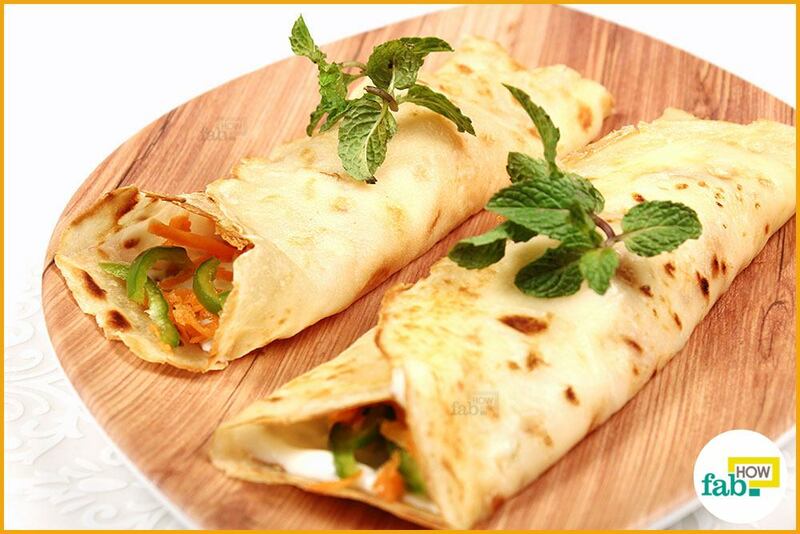 You can effectively display your culinary prowess at your next get together by dishing out delectable crepes that melt in your mouth. Beat 2 large whole eggs in a mixing bowl. Even consistency of the batter is very important for this recipe, so be sure to start off in the correct manner by beating the eggs nicely. 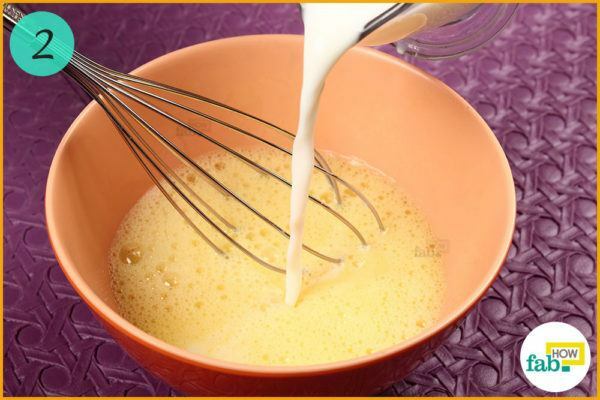 Now, pour ¾ cup of milk into the eggs, whisking continually. According to your preference, you may use whole or skim milk. Add ½ cup of water to the mix. Pour a steady stream of water, whisking all the while. 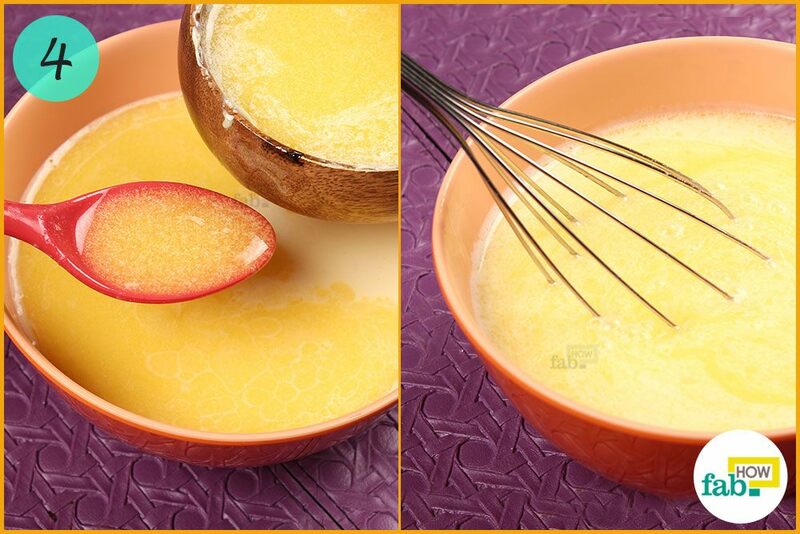 Measure 3 tablespoons of butter into the bowl and whisk it in. We melted our butter as it was straight from the fridge and hard. 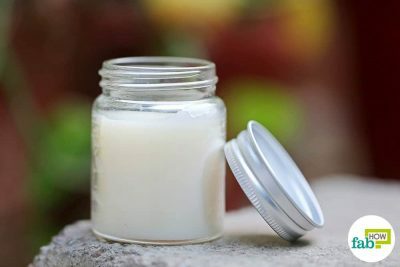 If your butter is at room temperature and soft, you can use it as is. 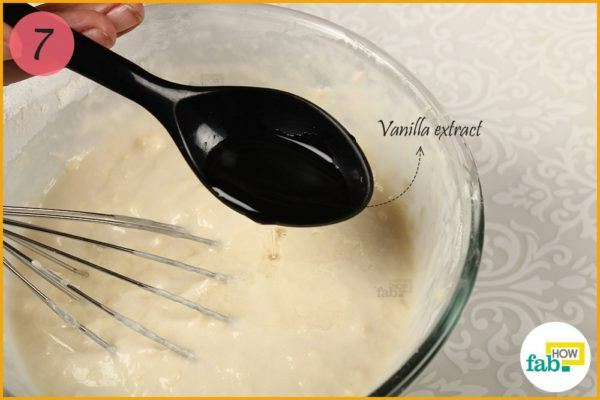 Add 1½ teaspoons of vanilla extract to the bowl. 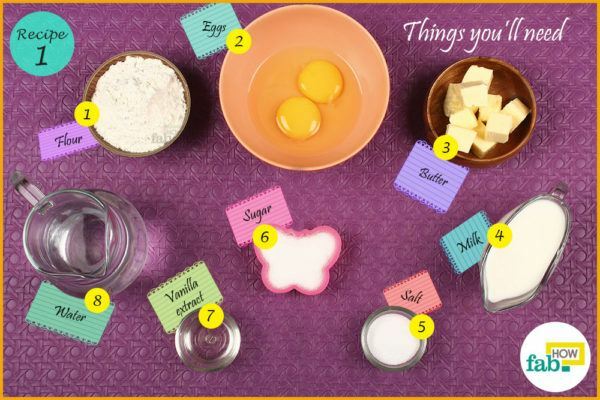 Whisk the ingredients together thoroughly. 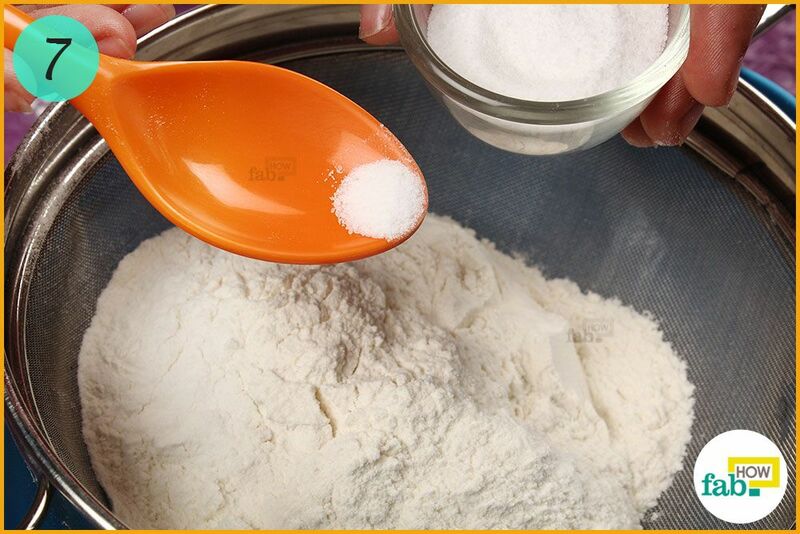 Set it aside while you assemble the dry ingredients. Vanilla is a versatile flavor that goes with a variety of fillings. If you have a certain filling combination in mind, you may use a different flavoring that complements your filling. Arrange a large strainer or mesh colander over a bowl. 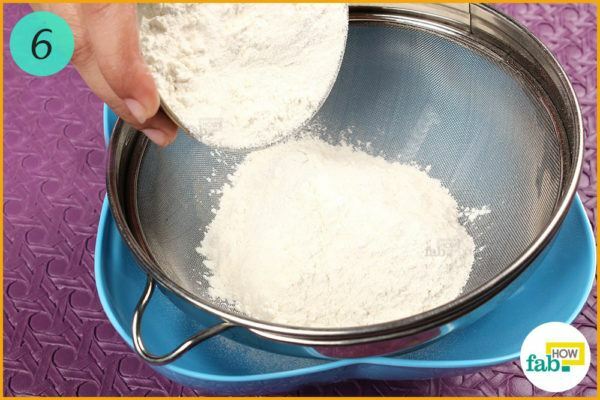 Measure out 1 cup of all-purpose flour and put it in the strainer. 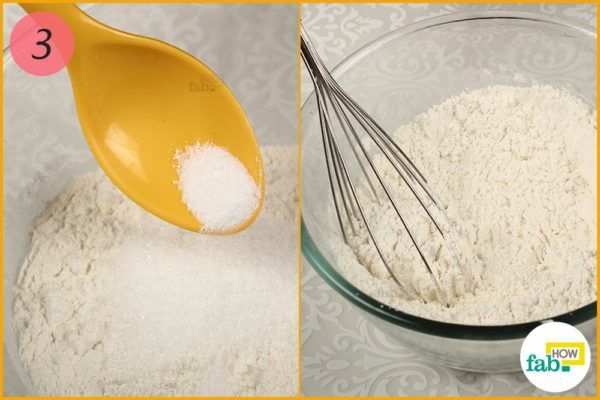 This should help you get rid of any lumps in the flour. 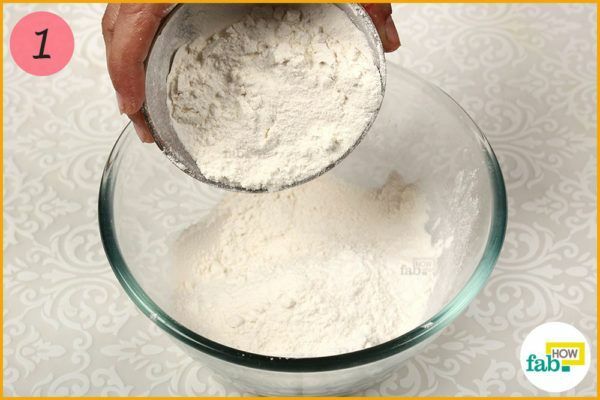 Add 1/8 tablespoon of salt to the flour. 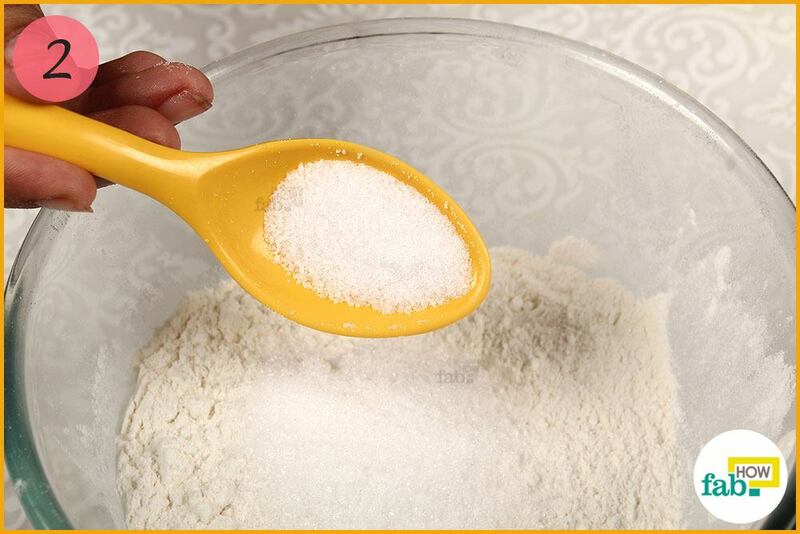 Add 1 tablespoon of ground sugar. Granulated sugar can be used as well, but ground sugar provides more convenience while sifting the dry ingredients and whisking by hand. When you’ve assembled all the dry ingredients together, sift them through the strainer. Sifting mixes the dry ingredients thoroughly and aerates them, especially the flour. This makes the resulting batter light. Now, gently whisk the egg and milk mixture into the dry mix. Be sure to work out any lumps that form during the process. 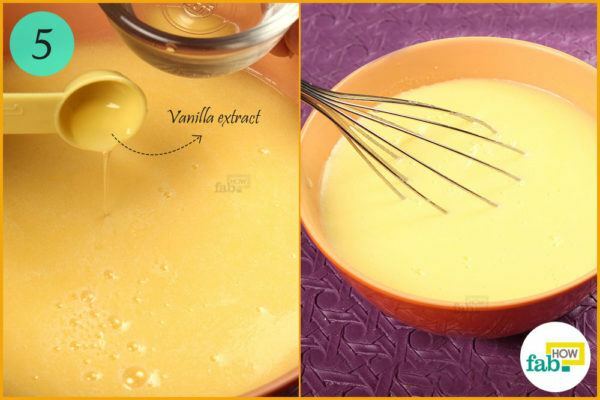 The consistency of the mixture should be that of a heavy cream. 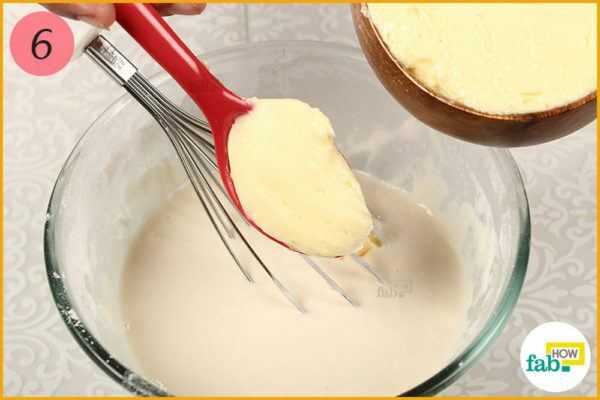 If your batter is the right consistency, it will be easy to work with in the pan. Strain the mixture. This will catch any remaining lumps. Your batter is ready, but you need to let it sit for 10 to 15 minutes. This will allow the batter to set and its flavor to develop. This also gives any air in the batter a chance to escape in the form of bubbles. These airy pockets cause undue tearing while making the crepes. Refrigerate the batter if it will be more than 15 minutes before you start cooking the crepes. Heat a pan over medium heat. Grease the pan with butter. If you’re a novice, be sure to use a nonstick pan. 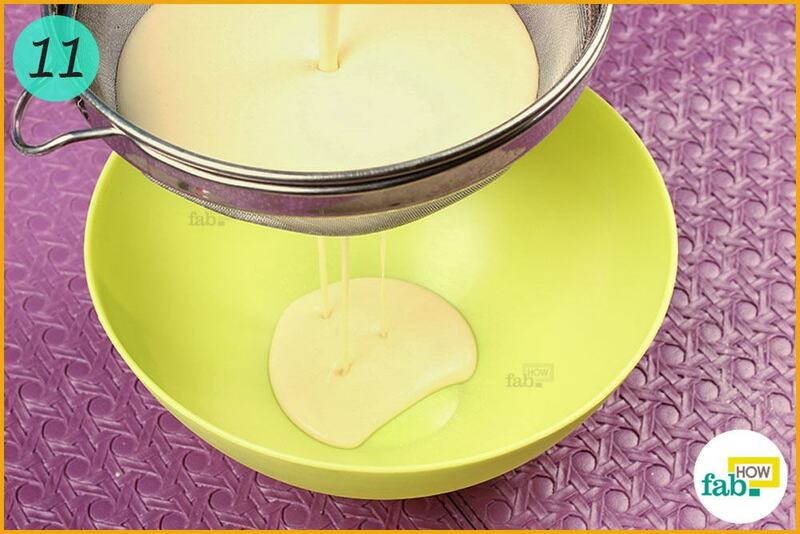 Pour the batter into the hot pan in a steady stream until it spreads out over the area of the pan. 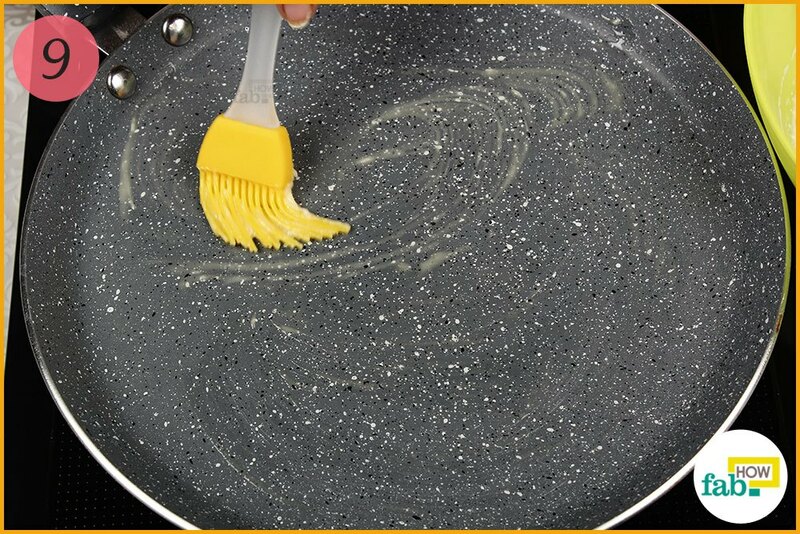 Swirl the pan to help the batter spread out evenly. Cook for about 1 to 2 minutes, then flip the crepe to cook the other side. Crepes are delicate. They may tear if you flip them using a spatula. Use a rubber or wooden spatula to lift it from the side. Then, use your fingers to flip it over. Cook the other side for 1 to 2 minutes as well, until it is a light golden brown on both sides. You may regulate the cooking according to your preference. 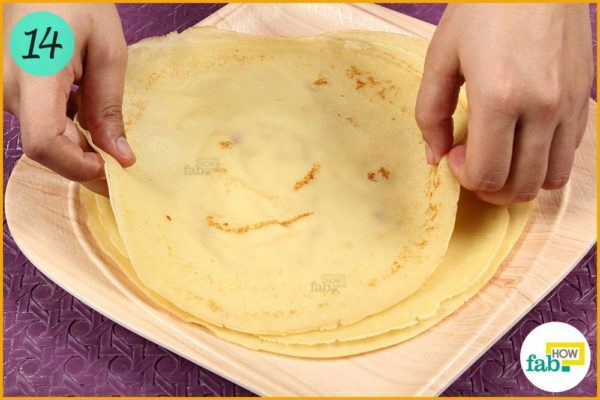 Transfer the crepe to a plate. Continue making crepes until you use up all the batter. Stack them on the plate. Once you’ve made the crepes, you can enjoy them right away or freeze them (after they cool down) until you are ready to serve them. For serving, you can use your choice of seasonal fruits and syrups as accompaniments or you can mimic our serving combination. 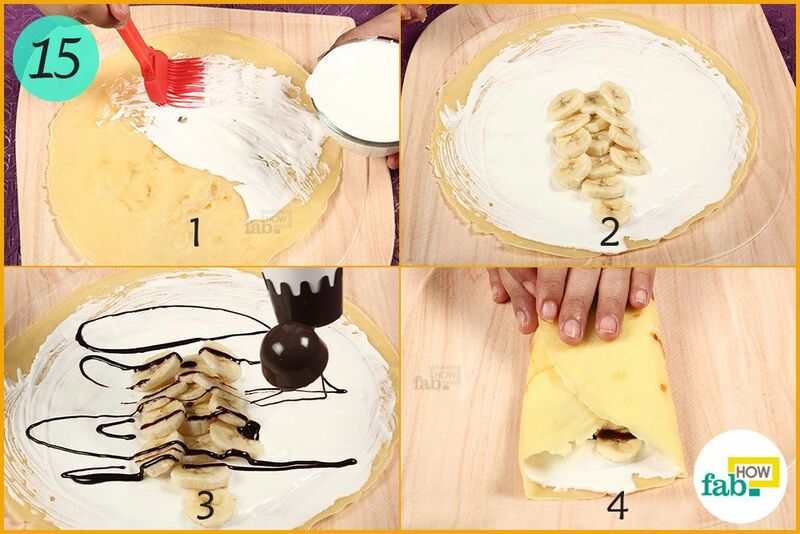 Here, we’ve coated our crepes with a layer of fresh whipped cream, topped them with ripe banana slices and drizzled chocolate sauce over them. You can fold the crepes any way you like. We used a simple 3-step fold. Fancy folding can also be used to complement any table arrangement. 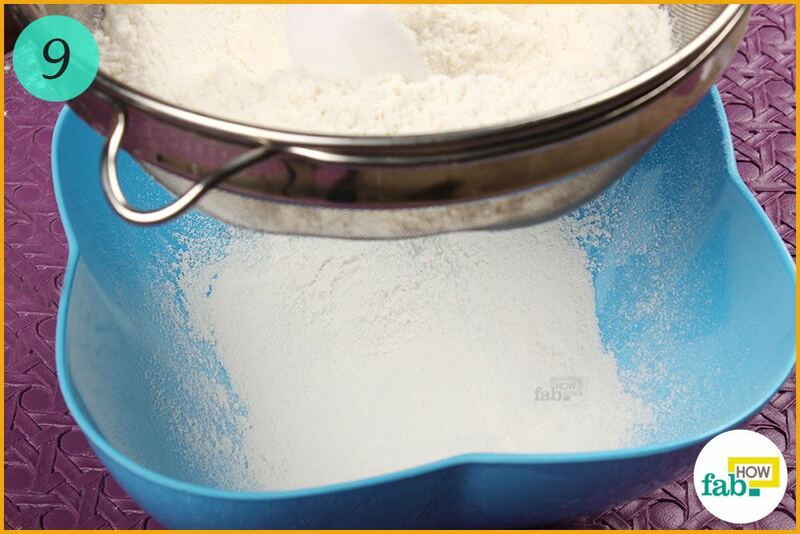 Measure 1 cup of all-purpose flour into a mixing bowl. Add 1 tablespoon of ground sugar to it. 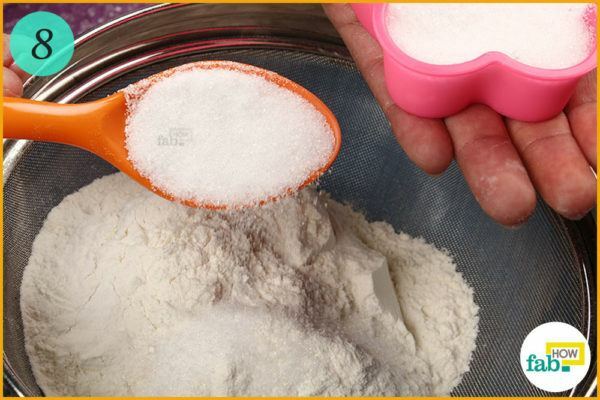 You may adjust the amount of sugar and salt according to the type of filling you plan to use – sweet or savory. Add 1/8 tablespoon of salt to it. Adjust according to your preference and filling. 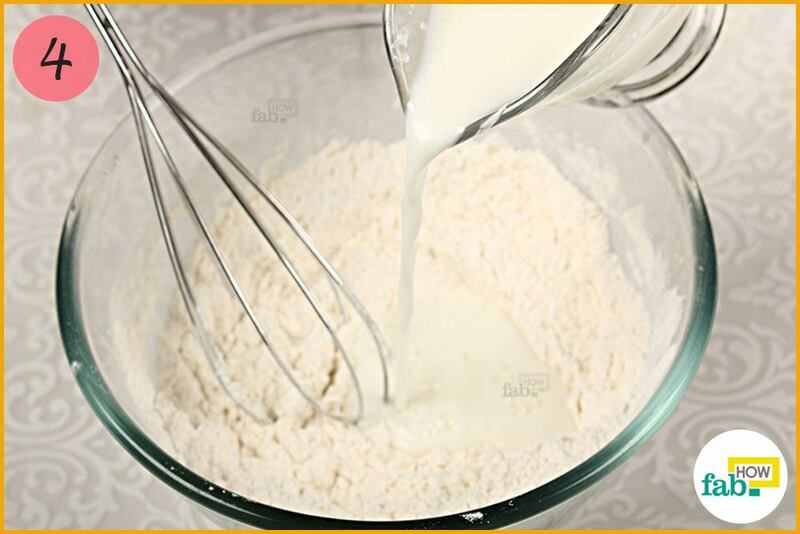 When the dry ingredients are well mixed, pour in ½ cup of milk, whisking continually. Add 2/3 cup of water to the mix as well, whisking all the while. Now, add ¼ cup of butter. The butter should be soft and at room temperature so that it can easily blend in. Whisk thoroughly. 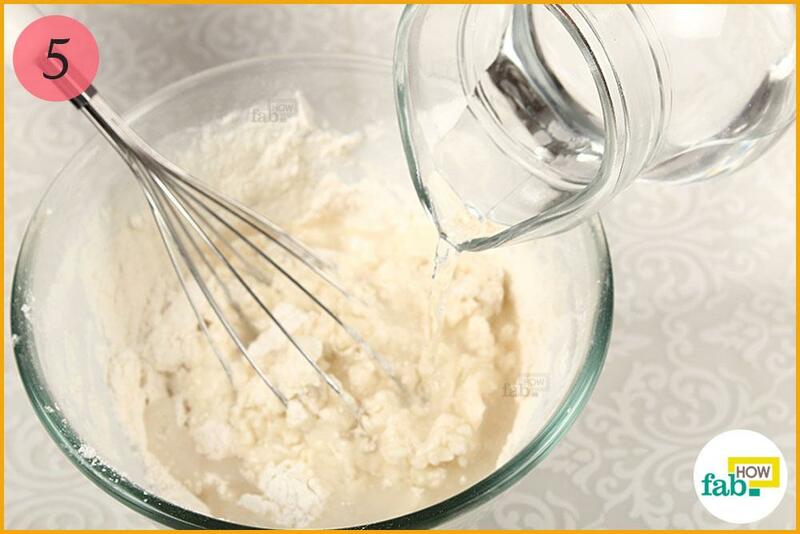 Add 1 tablespoon of vanilla extract to the mixture and whisk the ingredients thoroughly. Your batter is ready. 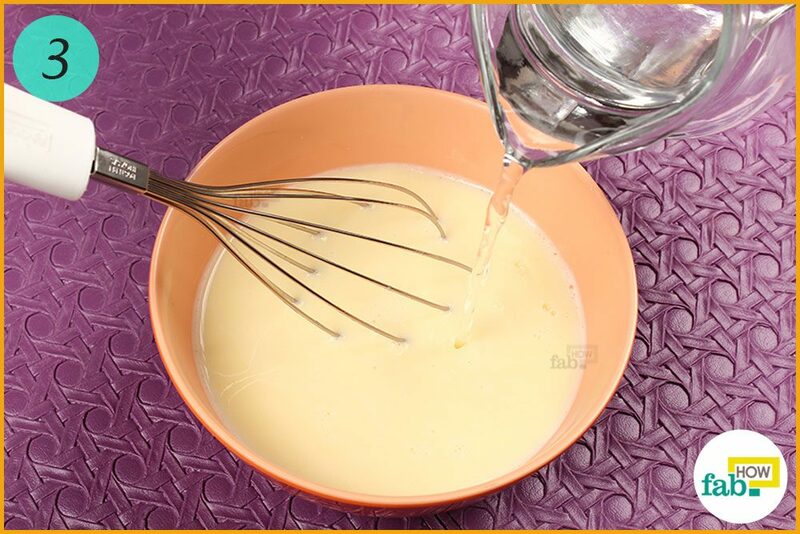 The consistency of the batter should that be of a heavy cream so that it spreads out easily in the pan. Now, strain the batter. This will remove any remnant lumps. Let the batter sit for about 10 to 15 minutes. This allows the batter to set and gives time for the air bubbles to come up, thus removing any air pockets in the batter. This helps reduce tearing of the crepes during cooking. Pour the batter into the hot pan. 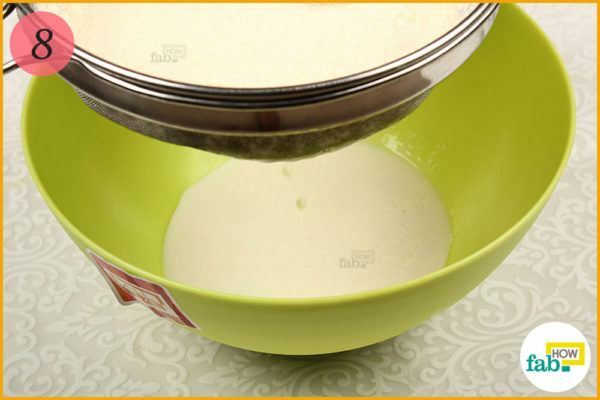 Swirl and rotate the pan to spread the batter evenly over the area of the pan. Let the crepe cook on one side for 1 to 2 minutes until it browns slightly. 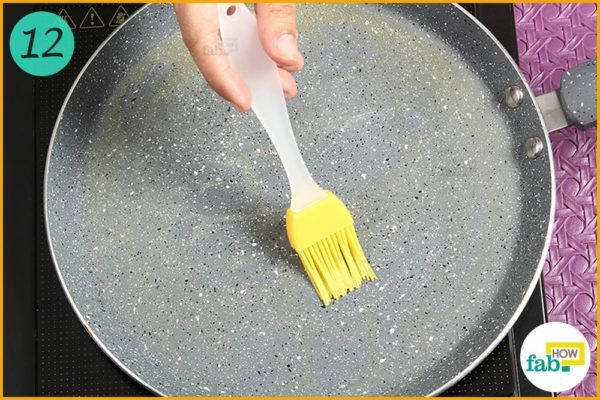 Use a wooden or rubber spatula to lift the sides and flip them over carefully. You may use your hands to assist during flipping to prevent tearing. Cook the other side for 1 to 2 minutes as well. Transfer it to a plate when the crepe is sufficiently cooked. You’ll get the hang of it after a couple of tries. If your initial attempts fail, don’t let that hinder your progress. You may use your own combinations of sweet or savory fillings for your crepes. 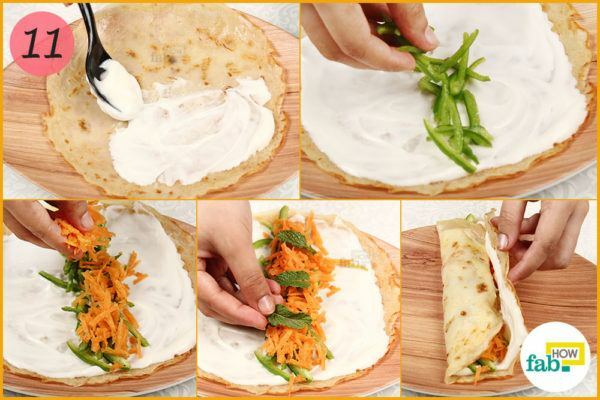 You can use our idea of a savory crepe filling as well. We spread mayonnaise over our crepes and added some shredded capsicum and carrots to it. We’ve put in some mint leaves as well. Here we’ve used a simple roll-and-fold for our crepes, but you can fold them the way you like. If the batter is too thick, thin it down with a little water. Improve the consistency of batter that is too thin by adding flour. 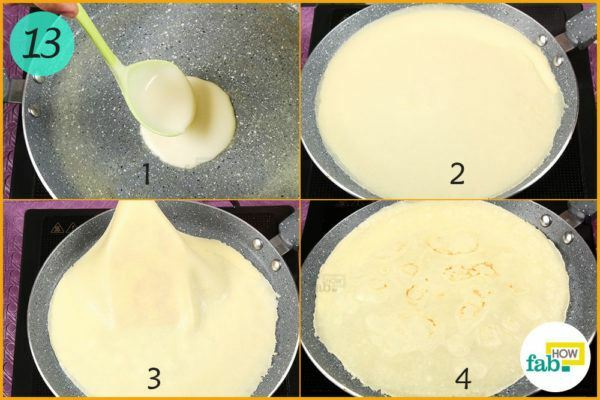 Depending on the kind of filling you intend to use in your crepes, you can adjust the sugar and salt ratio in the batter. Using hard butter while making the batter is not recommended. 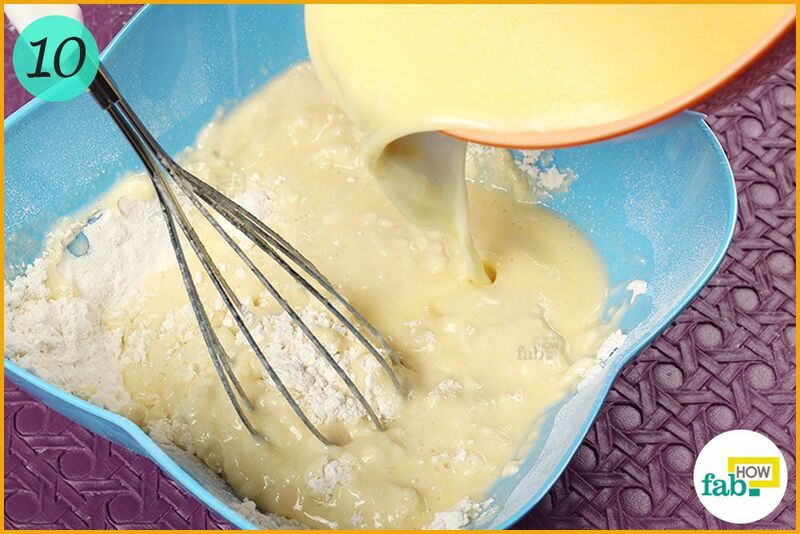 Soften up the butter by bringing it to room temperature in order to get an evenly textured batter. If you’re short on time, you can melt the butter over low heat. Crepes can be made using a variety of flours. Wheat and buckwheat are two popular choices. Using finger millets flour is another good alternative. Different flours give different tastes and textures to the crepes. 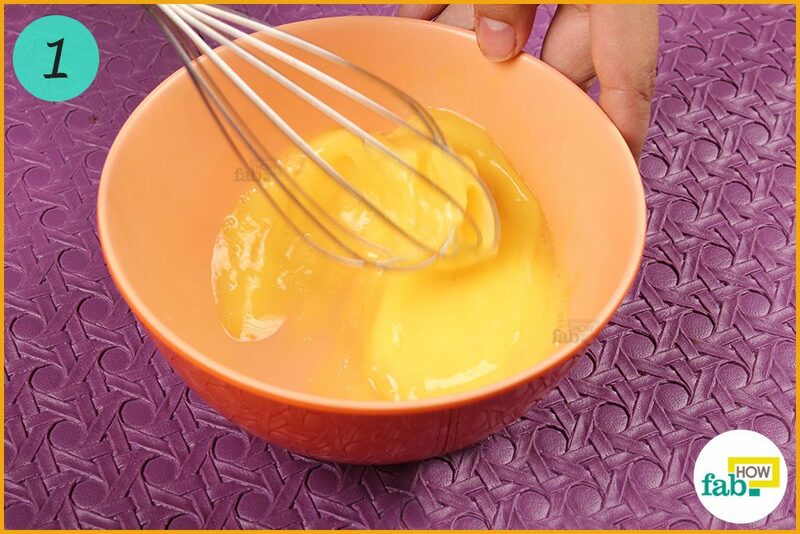 If you don’t have a great hand for whisking, try using an electric whisk while making the batter. 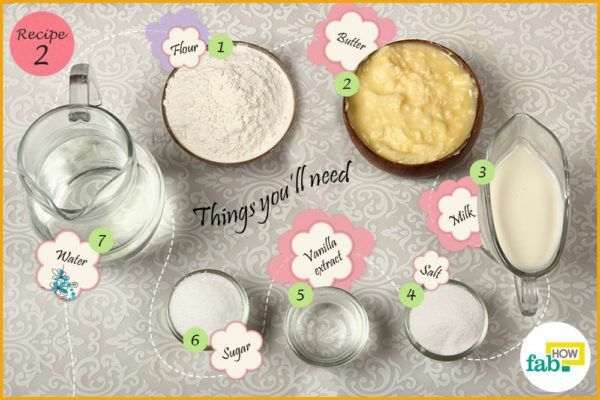 You can also blend the ingredients, dry and wet, in an electric blender. If you don’t have time to let the batter sit before cooking, tap the sides of the bowl with a spoon multiple times. This will make the air bubbles come up.